Abstract: This chapter is concerned with the conceptualisation of $, which in Lacan’s algebra stands for the ‘barred’ or the ‘destructed’ subject, the subject that is nothing, but full of emptiness. 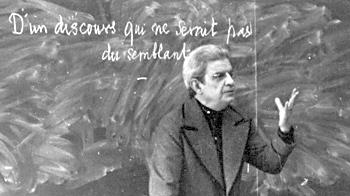 The Lacanian subject has no identity itself; instead it is defined by a lack that is filled by the Other. For Benjamin the flâneur, the dandy who strolled through 19th century Parisian arcades, is such a ‘destructed subject’. The flâneur’s subjectivity is characterised by a special empathy with the commodity that lures him into a ‘dream world’ in which the most mundane things for sale can be enjoyed. In what is a series of interruptions the image of the flâneur, who for Benjamin is the archetypical subject of 19th century modernity, is ‘translated’ into today’s world of 21st century ‘hypermodern(organ)ization’, whose main icon, it could be argued, is the management consultant. This interruptive ‘translation’ is done by way of discussing the ‘goings-on’ of commodity fetishism which is shown to be the main ‘phantasmagoric’ fantasy, or ideology, of modernity. It is argued that the commodity enables the subject to identify with what is otherwise a failing Other – the commodity-Other fills the subject. This paper’s critique of commodity fetishism is, however, not thought to be a call for a transparency of social relations. Quite the contrary, what is shown with Žižek is that precisely this belief in transparency is already part of the ‘goings-on’ of commodity fetishism. In what is the last move of this paper the question of hope is raised. It is argued that there is no hope for transparency, progress or a full identity of the subject; instead there is only hope for a failure of the relationship between subject and Other. It is precisely this failure which describes the political importance of the question of the subject and the Other.